There’s lots of good holes at Streamsong, but my favorite is No. 7 — a par-3 on the Blue Course. STREAMSONG, Florida – There are over 1,300 golf courses in Florida, more than any other state in the nation, but one facility stands head and shoulders above the rest. 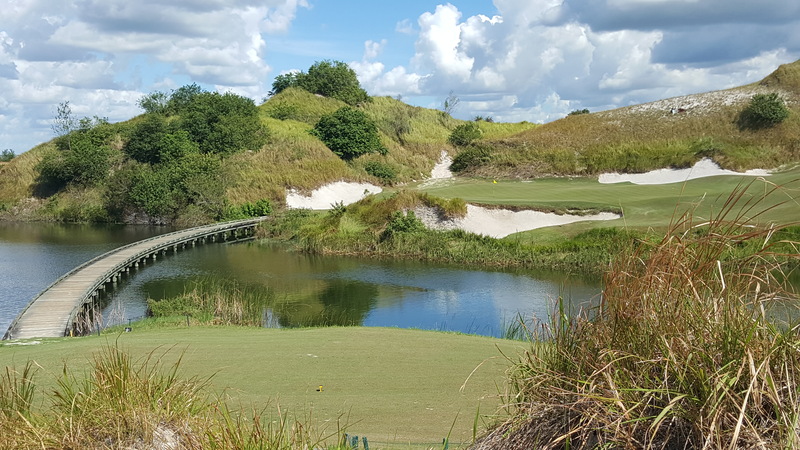 Streamsong Resort, located in the central portion of Florida, has three of the very best 18-holers – not only in the Sunshine State but in the entire United States — now that the Gil Hanse-designed Black Course has opened for public play. 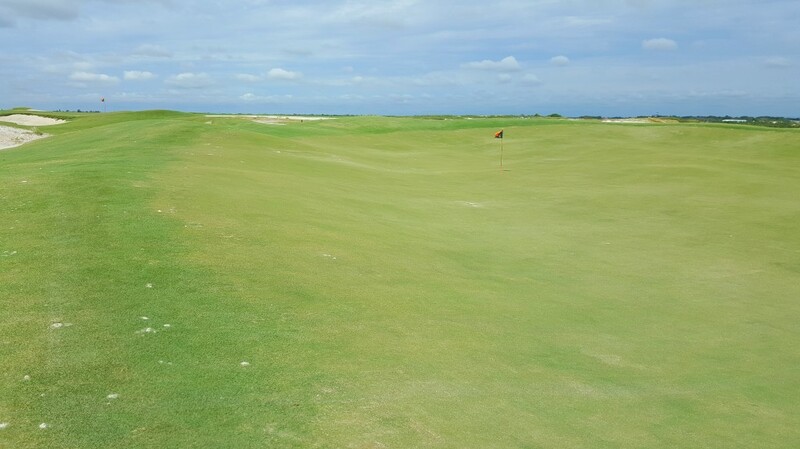 Punchbowl greens are a rarity, and this one can’t be seen from Streamsong Black’s No. 9 fairway. Streamsong had barely opened its doors in 2012 when we showed up unannounced for a quick tour on a get-acquainted mission that didn’t involve the hitting of a single shot. The intentional brevity of that visit underscored to us just how far Streamsong has come in only five years. Then it had two golf courses that – based just on the reputations of the architects – were sure to be well received by early players. There was no lodge then. Now there’s a big, state-of-the-art one that has 216 rooms. Lodging is also available at the Clubhouse, and there are four upscale dining restaurants plus a rooftop lounge on the property. The resort also offers such amenities as archery, sporting clays and bass finishing, but golf overwhelms the others, and more is certain to come down the road. The Mosaic Company, Streamsong’s owner, has 16,000 acres to create more golf options on what once had been a phosphate strip mine. How that land will be used remains to be seen but one very dedicated – though admittedly low level – employee told us that the goal was to eventually have nine courses, each with its own clubhouse. Wilson said that won’t happen and is cautious in discussing any growth possibilities. 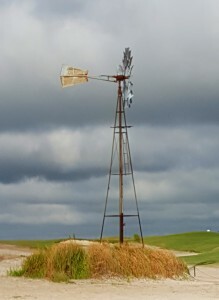 This windmill is the logo for Streamsong Black, and is also the key point of reference for players on the course. “Our goal has been to open three courses, make sure we’re doing it right and make sure our guests are having a good time,’’ he said. That’s already happening and, while the growth of golf overall has been slow in recent years, it’s never lingered at Streamsong. An expansion to at least five courses in a relatively short period of time seems a given. That’s the number of courses at Bandon Dunes, the Oregon golf mecca that – like Streamsong – is managed by Chicago-based KemperSports. Comparisons between Bandon and Streamsong will be inevitable as more players visit both hotspots. I already have my opinions on that, but will save them for a later date. For now it’s time to celebrate the arrival of the Black Course. Its formal opening festivities in late September were sold out for months in advance. Like the Red, designed by Bill Coore and Ben Crenshaw, and the Blue, designed by Tom Doak, the Black is basically a walking-only course. Carts were available in the afternoons during our visit but walking – either with a caddie or a rickshaw (a basic pull cart) – was much more appropriate and a better way to enjoy the unique Streamsong experience. 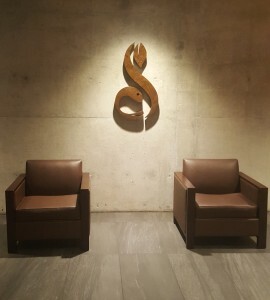 Streamsong’s understated logo and masculine decor reflect the resort’s sleek architectural style. First-time visitors should be aware of two things: Streamsong doesn’t come cheap (it shouldn’t surprise anyone that this kind of quality golf would come with a commensurate price tag) and a degree of physical fitness is a requirement. Our caddies told us that playing the Black Course meant an eight-mile walk and the other two were about a mile less. For the sake of comparison, a walking round on the Black didn’t seem quite as tiring as similar rounds at either Chambers Bay, the 2015 U.S. Open site in Washington state, or Erin Hills, the 2017 U.S. Open venue in Wisconsin. Considering how much hype the Black opening created in the golf world I didn’t feel the new course overshadowed Streamsong’s other two layouts. For me the hole with the best wow factor on the property was No. 7 on the Blue, a par-3 that could play anywhere from 97 to 203 yards with a walk across a bridge needed to get from the tee to the green. As for a favorite course among the three I agreed with all of my playing partners from the three-day visit. (They came from Illinois and Virginia, played all three courses during their stay and we had not met any of them prior to our rounds together). All of us liked the Red the best, for whatever the reason. 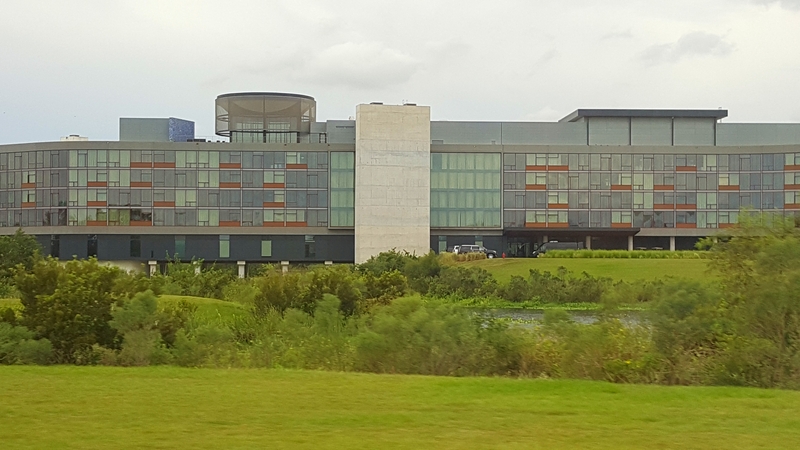 The Lodge, with its 216 rooms, is the main gathering place for Streamsong’s visitors. The Black, though, has some features that the others don’t. Hanse’s fame as an architect took off with his creation of the Brazil course that hosted the 2016 Olympics golf competition, and Streamsong Black has been described as “bigger, broader and bolder’’ than that course in Rio de Janeiro. After playing it for the first time your No. 1 memory will be the highly unusual punchbowl green on No. 9. It’s about 60 yards in width and depth, but you can’t see it from the fairway. There are two putting surfaces at No. 3, another par-4. The bunkers are numerous and eye-catching throughout the course because of their sharp, ragged-shaped edges. Water comes into play only minimally, at Nos. 3 and 18. The Black, the only Streamsong course that plays to a par of 73, has three par-5s on the back nine and the course – at 7,311 yards from the back tees – has a maximum length about 200 yards longer than the Red and Blue layouts. The Black is built on 300 acres and has 86 acres devoted to fairways and 11 to putting surfaces. 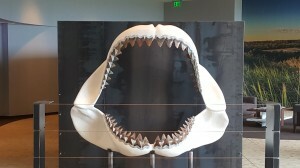 The teeth from prehistoric inhabitants on the land on which Streamsong was built were used in this lobby exhibit at the Lodge. Hanse’ creativity extended beyond his 18 holes. He included an extra 340-yard par-4 cutoff hole that finishes at the clubhouse for players who want to play just nine holes. It’s part of a state-of-the-art practice facility dubbed The Roundabout. There’s also a two-acre putting green, called The Gauntlet, available and the course configuration allows for play in six-, nine- and 12-hole loops to create a variety of playing options. The second-highest point on the property is on the Black Course, and you can see the other courses from there. All have their own flavor. “They’re all a lot of fun to play. 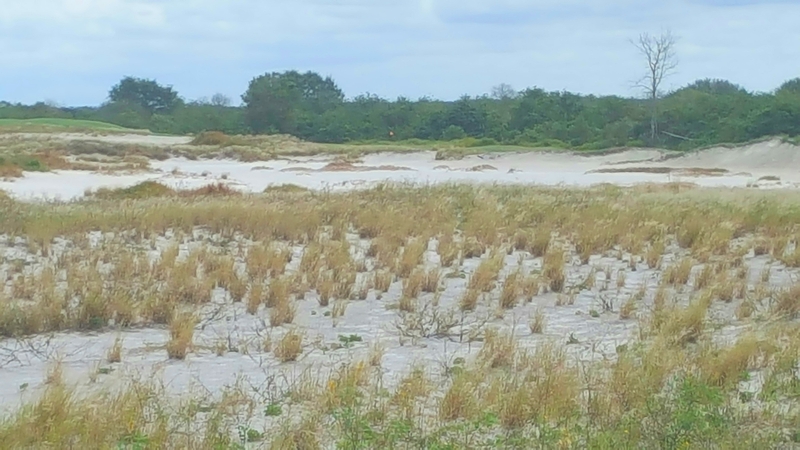 You have to use your imagination over all the property,’’ said Wilson, who doesn’t see Streamsong hosting a truly big tournament like a U.S. Open or PGA Tour event despite the obvious golf riches available. Understandably there’s some doubt about that, and the scheduling of any such event would also have to fit into Florida’s weather patterns. Still, the U.S. Golf Association has played one of its national championships at Streamsong and smaller Ladies PGA or Champions Tour events might make for a good fit there, too. 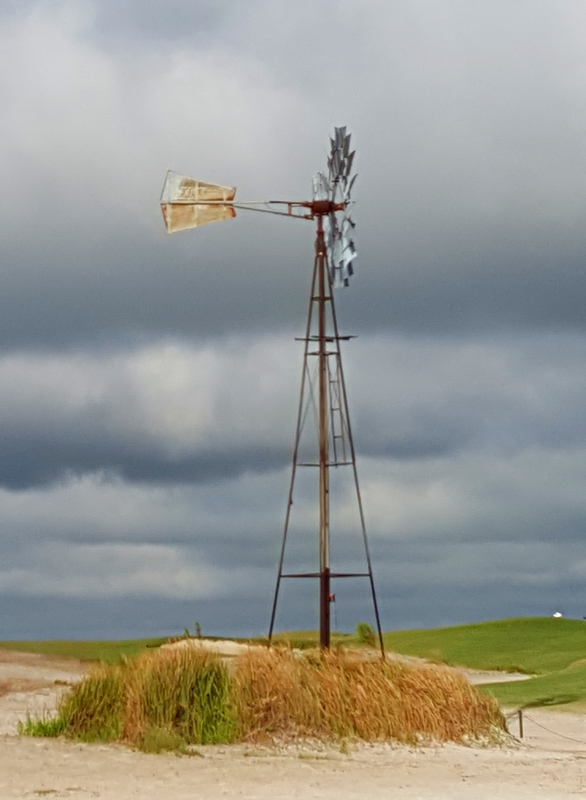 Architect Gil Hanse made good use of rugged terrain in creating Streamsong Black.